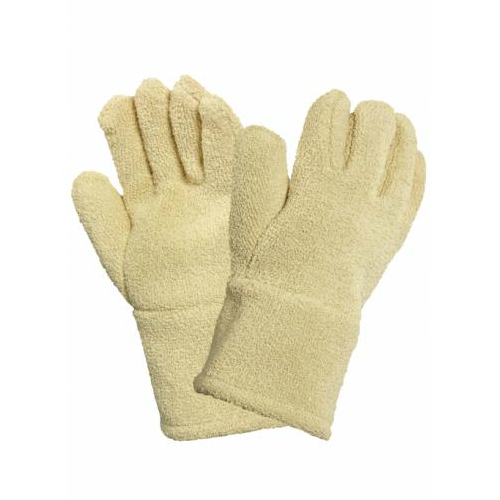 The Marigold Industrial Comahot Heat-Resistant Gauntlet Gloves are long-cuffed terry loop gloves with a fire-retardant aramid outer and a comfortable 100% pure cotton inner. Providing outstanding resistance to not only contact and convective heat, but also cut and tear, the Comahot Gloves are ideal for manual handling applications involving hot materials and/or sharp-edged objects. Featuring a terry loop aramid outer and gauntlet-style cuff, the Marigold Industrial Comahot Gloves provide excellent protection against thermal risks to not only the hands, but also the wrists and forearms. When tested to EN 407:2004 to determine their resistance to flame and heat, these gloves were shown to be fire-retardant, as well as protect against contact heat up to 350°C and convective heat. These gloves provide excellent mechanical protection, achieving the highest rating possible for cut resistance when tested to EN 388:2003 standards. During testing, the Comahot Gloves also achieved a rating of 4 out of 5 for resistance to tear, and a rating of 2 (also out of 5) for both abrasion and puncture resistance. As a result, the Comahot Gloves are suitable for many applications that require the handling of sharp materials or tools. These gloves are available in one size only. Please consult the table below for sizing details. Please note that the gloves have a length of 310mm.